In August, we celebrate two Great Feasts of the Church: the Transfiguration of our Lord and God and Savior, Jesus Christ, and the Dormition (Falling Asleep) of Our Most-holy Lady the Theotokos and Ever-virgin Mary. The first of these feasts commemorates the events described by the Evangelists Matthew (17:1-13) and Luke (9:28-36). In view of His forthcoming death on the cross, the Lord revealed to His chosen disciples the voluntary character of His passion and death. His bright transfiguration on Mount Tabor assured these witnesses that Jesus Christ, the Son of God, is truly His Father’s radiance, the Deliverer Who freely, out of His love for us, paid our terrible debt of sin with His most pure blood. And He did this freely, voluntarily, out of love. One of the particularities of this great feast is the rite of blessing grapes and apples. The tradition of bringing the first fruits of summer into the temple is positively ancient. In the Christian Church, it is a continuation of Old Testament practice, and is sanctified by the Apostolic regulations (Canon 3). Although the date of August 6, as the day when fruits shall be blessed, is determined by the natural influence of harvest season, the theological significance of this rite can be seen in the message of the Feast. 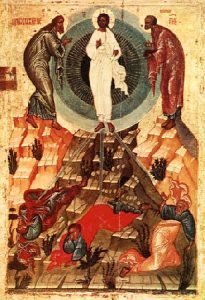 In the Transfiguration, the Lord was pleased to show us the new, spiritual, transfigured condition to be acquired by man and the entire creation, through the Resurrection of the Savior, the condition that will be realized in the Universal Resurrection. All nature is suffering along with humanity because of our sin, and with us, she is looking for Resurrection and renewal from God. The Church, in blessing the fruits, gives assurance of this hope.